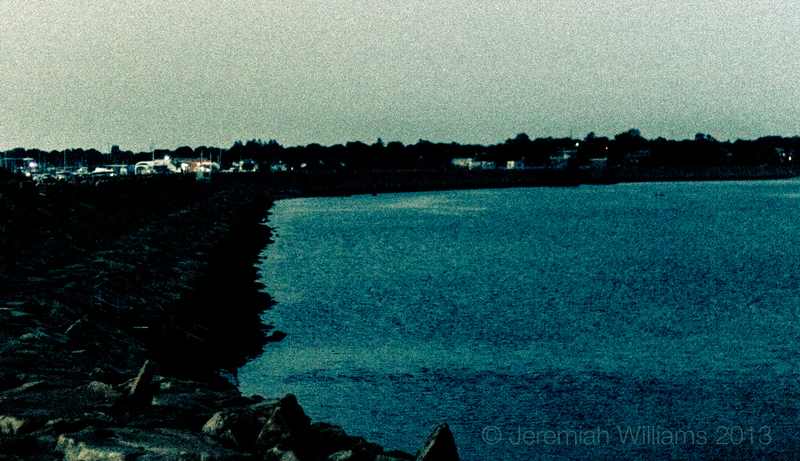 By the Water – A duet of photography and writing. Photo taken by Jeremiah Williams. In New Bedford, MA. On May 30th 2013. What would it be like to live by the sea? Near water, it seems thoughts are clearer, and have a slower pace. Perhaps, there is a profound physiological reaction that caused from the nearness of water. It relaxes, it soothes, it even surrenders us. Water can create and destroy life. There are many robust and yet subtle properties that water contains. The sea affects all the senses. Inside the ears, it presents a down-tempo rhythmic swish and swash. It is the heartbeat of mother nature herself. Through the eyes it provides a clear reflection of what is above it, or a beautifully textured, glistening, distortion of light. It keeps it from becoming dry and cracked and maintains the body’s natural balance of moisture. In a word, salty, tastes the sea. Water can give life to all things that are near. People, plants and animals, will die without it. Although the rains spread it out, it only delivers a small fraction of the whole. To lift up all that massive weight would take an act of unbridled strength. We are all born in water. Water is necessary for all things to grow. Water quenches natures thirst to thrive and grow. Water can take the lives of many. When a tornado, hurricane, twister or strong winds blow large bodies of water, it can eradicate life on huge areas of land. An earthquake may cause water to rise up hundreds of feet above sea level. A Tsunami has killed almost one-third of a million people in Indonesia in 2004. It is among the deadliest of forces which mother nature wields. Water will drown things that need air to survive. When water is frozen is creates land masses that have made walkways. This is called an ice-bridge and supposedly enabled humans access to other continents, during the ice-age. Frozen water makes refreshing desserts. Some people like to skate over the frozen water. There exists a wonderful treat for children made mainly of frozen water. It is called a popsicle. Some believe it to travel from two continents over an ice-bridge. When water boils it removes bacteria and dirt. Water is used to make stew and soup and so many other meals too. Hot water can also scald the skin, making the skin sting for days on end. Water gives life and takes it away. Water always coats everything it touches without ever missing a piece. With it’s unimaginable size and weight, is hard to imagine a force that can tame it. Water is beautiful and still terrifying. Yet ,there it sits. Perfectly adjusted to its surroundings and behaving like an obedient child, at least for right now. Written by Jeremiah Williams to accompany a photograph taken by Jeremiah Williams. This photograph was taken by a hurricane bridge in New Bedford, MA. On the last day in May in 2013. While he was up to visit his Aunt and cousins in a home that was an integral piece of history within his family, and is now being sold due to economical reasons. Photo taken in the Delaware Water Gap, by Jeremiah Williams, on a nice spring afternoon in June.